The current Eurovea complex and its second-phase extension are keys parts of the EUROVEA CITY quarter, significantly enhancing the appearance and life quality in this newly-emerging modern centre of Bratislava in the Pribinova and Nivy zone. 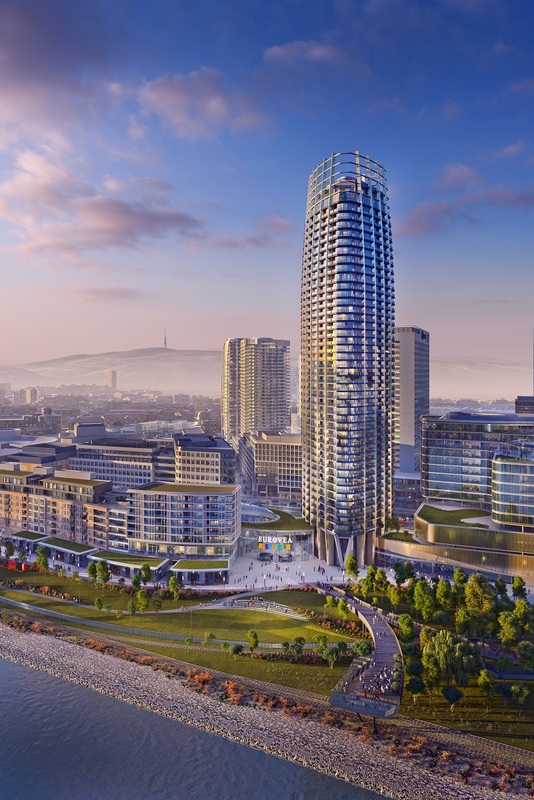 The Eurovea 2 project has received a land-use decision for six buildings, including the high-rise residential EUROVEA TOWER, and in accordance with the applicable regulations continues the territorial procedure and obtaining of permits for further parts and buildings. Eurovea 2 has undertaken comprehensive transport capacity assessments of all site projects – resulting in proposals for specific measures and adjustments to all the area’s key intersections and roads. 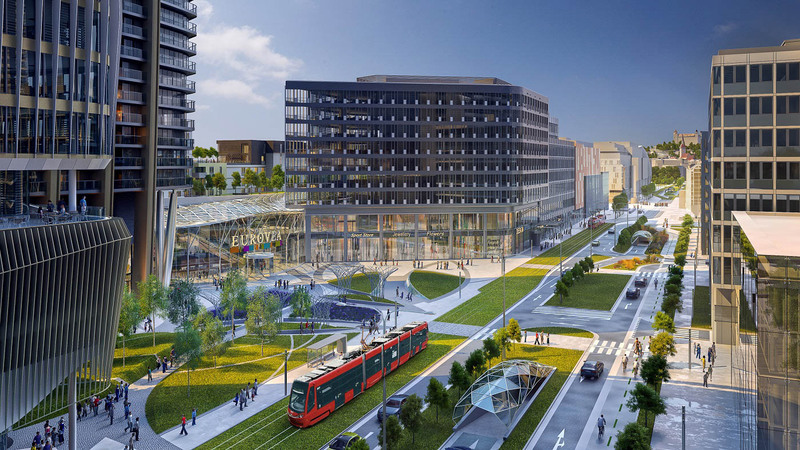 The transport concept includes the developer’s proposal to build a new central tram route – this would improve current routes and allow connections to the city’s largest suburbs of Ružinov and Petržalka. The solution of EUROVEA CITY’s public spaces is conceptionally addressed by renowned architect Beth Galí, who in addition to emphasising aesthetics and greenery is also dedicated to addressing multiple mobility modes in the new quarter. “At EUROVEA CITY we’re continuing to build a new quarter over a large area, a process that necessitates a comprehensive and patient approach. We must take into account our site’s specifics, interaction with neighbouring projects, and – for example – how this waterfront part will communicate with the opposite side of the Danube that still awaits development,“ says J&T REAL ESTATE (JTRE) Managing Director, Pavel Pelikán. The signing of Eurovea 2’s land-use decision represented the culmination of a four-year process involving a territorial planning investment plan, as well as urban and territorial-technical conditions. This process included intensive communication with representative from Bratislava’s city districts of Ružinov and Old Town where most of the new quarter is located. The Eurovea 2 project has received a binding opinion from the capital city of the Slovak Republic – Bratislava that constitutes the law of the Territorial Planning Authority. In the context of territorial proceedings, objections arose related to the project’s potential non-compliance with Bratislava’s territorial plan. The Construction Authority of the Old Town suspended the territorial proceedings and repeated its request to the Territorial Planning Authority to confirm a binding opinion. 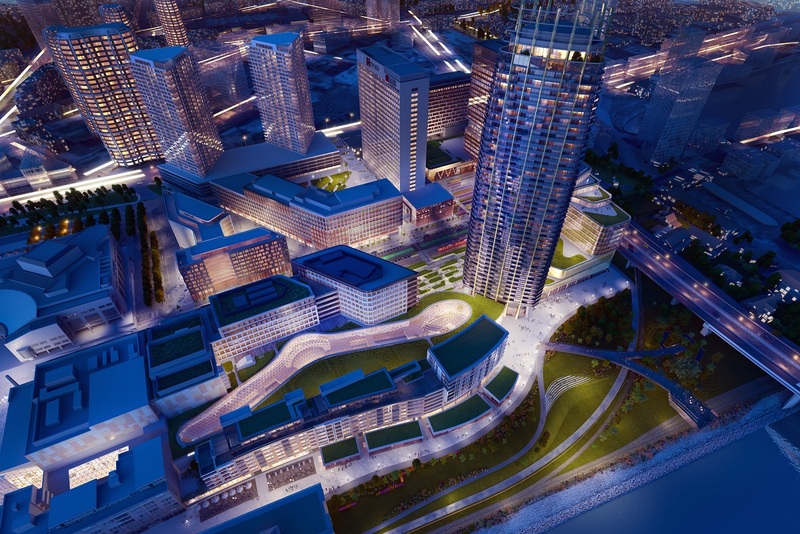 This binding opinion was confirmed by the capital city, and consequently a land-use decision was issued for the Eurovea 2 project, encompassing six buildings, including the high-rise residential EUROVEA TOWER. “As with all our projects, Eurovea 2 also complies with all applicable regulations, and respects the legal competences and decisions of the relevant authorities and institutions,“ adds Pavel Pelikán. The developmental organization and regulatory conditions for the Pribinova zone were set by the city when the area was first developed (today's Tower 115 and Slovak National Theatre (SND)) on the basis of a proposal by the Bauer, Paňák and Kusý architect team in 1988. Just like the zone’s current buildings, future constructions will also fully respect and translate this system into a genuine city district. The system also serves to define the principle of building heights, which graduate from Dostojevsky Row in the direction of Košicka Street. During the SND’s construction in the Pribinov area, a tall building near today’s Apollo Bridge had already been contemplated to highlight this area’s importance. 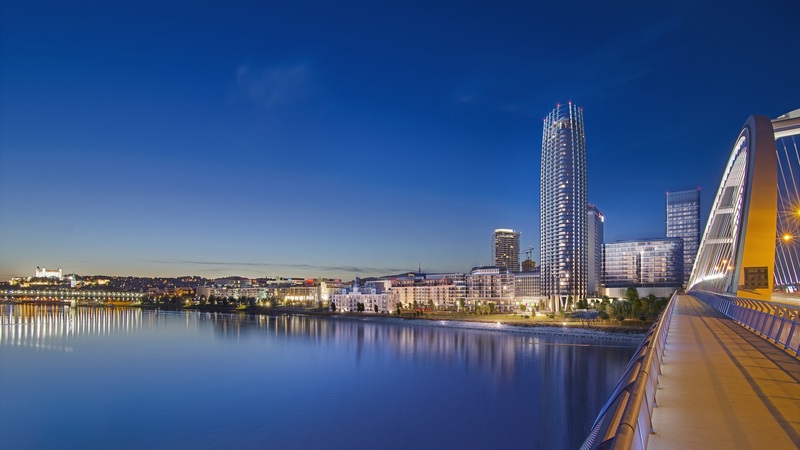 The high-rise EUROVEA TOWER in this locality should therefore be seen in the context of Bratislava’s long-term and continually-evolving Danube riverside plans. 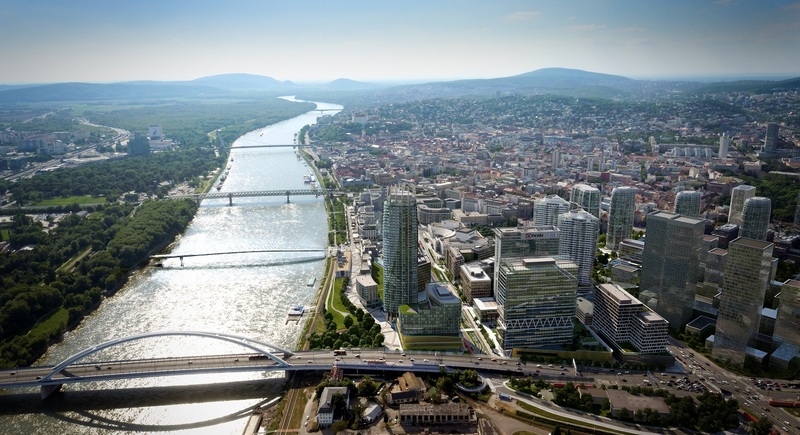 The city’s dynamic development over the last twenty years has brought about the expansion of a new modern city centre, and multiple other high-rises will emerge around the Pribinova zone – enhancing Bratislava’s city-wide panorama. Drawing on these assumptions is Slovakia’s ‘first residential skyscraper’ - EUROVEA TOWER - which compositionally emphasizes the link between the riverfront to the cross urban axis, creating a node between the historic city centre and the new development zones adjoining Čulenova Street. The 168-meter residential tower results from detailed expert judgment – from the perspective of local suitability, impact on the city’s panorama and views, as well as optimal technical and technological solution. "We also consider it important to be in a high-rise designated zone that respects building variability and heterogeneity. This prevents potential neighbouring high-rises forming a "wall" that impacts the area’s positive perception,“ says Pavel Pelikán. Based on the transport-capacity assessment, all major intersections should be adjusted accordingly: by VÚB, Košická – Mlynské nivy – Prievozská, Landererova – Most Apollo, and by Allianz. There should also be a change in road usage alongside the SND building to make it public-use and part of the road communication network. All modifications of roads and intersections are based on the capital city’s concept, and all such changes have been discussed and consulted with the City Hall, the transport inspectorate, and city districts. The Eurovea 2 project has accordingly been positively assessed by the specialist services of the capital city as well as the Regional Transport Inspectorate. Developer JTRE is simultaneously intensively engaged in the transport solution of a new central tram circuit on the route Šafárikov Square to Pribinova Street and onwards to Eurovea, with connection to Košická Street. An integral aspect of the project is fully adapting Pribinova boulevard and constructing a corridor for the future tramway. Architect Beth Galí is elucidating an ideal layout to respect the needs of pedestrians, cyclists and motorists, and preparing a proposal for a comprehensive solution for the zone’s public areas. The ideal framework proposal also envisages the potential extension of public spaces to beneath Apollo Bridge - which although is not land owned by JTRE, represents an opportunity to leverage the waterfront’s outstanding potential as a functional active public space.